Our Gears of War 3 COG Tags Locations Guide shows you all 15 COG Tag locations in order to obtain the “Remember the Fallen” Achievement worth 15 Gamerscore for the Xbox 360 exclusive shooter. This achievement can be obtained on any difficulty, as well as in Standard or Arcade mode too. There are a total of 5 COG Tags in ACT 1. You will find this COG tag right as soon as you exit the cell. It will be inside of the next closed cell lying on the ground in the doorway. You will find this COG tag after the helicopter has landed and killing all the Lambents on the deck afterwards. You need to find a cargo container with the Gears of War logo spray painted on it in the far left corner. Then behind the trailer look above it to find a dead soldier hanging with the COG tag on him. You will need to shoot the dead body for the COG Tag to drop on the ground in order to pick it up. There are no COG tags in this chapter. You will find this COG tag at the end of the grocery store area when you use the Loader Machine for the first time to push the overturned locker blocking your path. Then get out of the Loader and head into the next office room to the right to find it on top of the desk to the left of the computer monitor. You will find this COG tag immediately after you exit the Camp’s warehouse and start to head towards Cougars Stadium. 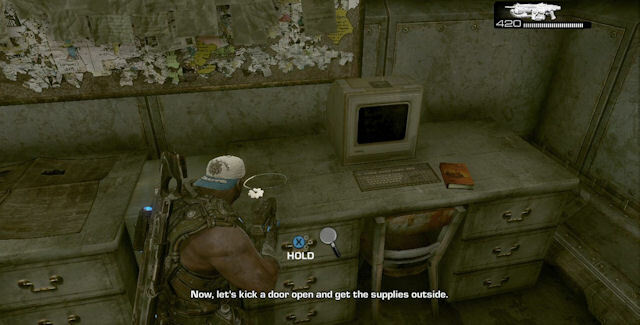 Then as you exit through the doorway, go left and follow the brick wall to find another Gears of War logo spray painted on it and leading towards the docks. It will be lying next to a dead man on the docks. You will find this COG tag on the walkway below the bridge just past the toll booth when you enter the enclosed part of the bridge. In order to get to it, you need to use 1 of the 2 ladders inside of this enclosed area, the first ladder can be found on the left as you enter before the white van and the second ladder can be found further into this area on the right side. It will then be lying behind the short wall on the walkway.